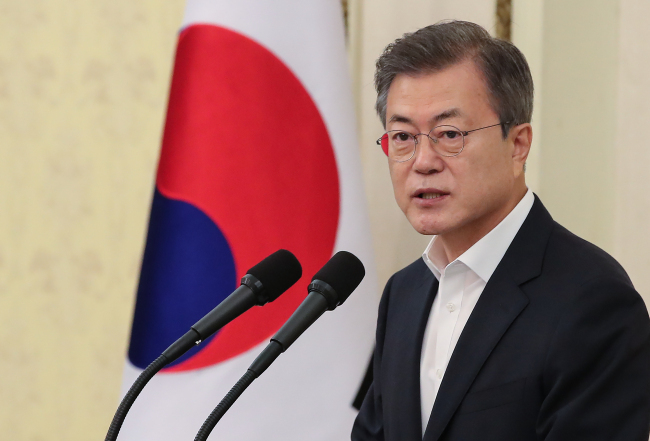 President Moon Jae-in called Saturday for an unswerving reform drive despite a falling approval rating and controversies over his economic policy. He was speaking at an unprecedented gathering of all ruling party lawmakers, Cabinet members and presidential officials. It came two days after Moon's first Cabinet shake-up to replace five ministers, including the defense chief and the top education policymaker. Late last month, the Democratic Party of Korea picked Rep. Lee Hae-chan, a seven-term lawmaker, as its new leader. "The task of the times that we have to achieve together is clear," Moon said. It's to create a fair and just country through strong and constant reform measures, widely dubbed the "liquidation of past malpractices." He pointed out that South Korea is at a time of a "grand shift." He stressed the need for addressing the gap between the haves and have-nots via an appropriate distribution policy and promoting the co-prosperity between South and North Korea on the basis of denuclearization and a peace regime. To that end, the president said, Cheong Wae Dae, the ruling party and the government should make concerted efforts. Moon's approval rating recently dropped below 60 percent, according to opinion polls.